Hyponatremia is a medical condition termed for a low concentration of sodium in the blood (serum). By definition, hyponatremia occurs when serum sodium levels in the plasma fall below <135mEq/L. This has been shown to occur in up to 30% of ultra-endurance participants. Hyponatremia is mainly caused by overhydration, but can also be caused by intake of hypotonic fluid in excess of sweat and urine output, excessive sodium losses, or other hormonal dysfunctions that affect the maintenance of sodium stores in the body. The table below shows the risk factors associated with hyponatremia. Educate athletes of risks from fluid overload and encourage moderate hydration. Establish individualized hydration protocol based on personal sweat rate and sports dynamic. Allow 8-14 days of training in the heat for acclimatization. What puts an individual at risk for hyponatremia? How do you know if this is hyponatremia? How do you treat an individual with hyponatremia? Athlete will need to be educated on proper hydration before, during and post exercise to avoid the risk of suffering from hyponatremia again. Almond CS, Shin AY, Fortescue EB, et al. Hyponatremia among runners in the boston marathon. N Engl J Med. 2005;352(15):1550-1556. Armstrong LE, McDermott BP. Exertional hyponatremia. In: Casa DJ, eds. Preventing Sudden Death in Sport and Physical Activity. Sudbury, MA: Jones & Bartlett Learning. 2012:185-199. Binkley HM, Beckett J, Casa DJ, Kleiner DM, Plummer PE. National Athletic Trainers’ Association position statement: exertional heat illnesses. J Athl Train. 2002;37(3):329-343. Casa DJ, Clarkson PM, Roberts WO. American College of Sports Medicine roundtable on hydration and physical activity: consensus statements. Curr Sports Med Rep. 2005;4:115-127. Casa DJ, Armstrong LE, Hillman SK, Montain SJ, Reiff RV, Rich B, Roberts WO, Stone JA. National Athletic Trainers’ Association position statement: fluid replacement for athletes. J Athl Train. 2000;35(2):212-224. Convertino VA, Armstrong LE, Coyle EF, et al. American college of sports medicine position stand. exercise and fluid replacement. Med Sci Sports Exerc. 1996;28(1):i-vii. Noakes TD, Sharwood K, Speedy D, et al. Three independent biological mechanisms cause exercise-associated hyponatremia: Evidence from 2,135 weighed competitive athletic performances. Proc Natl Acad Sci U S A. 2005;102(51):18550-18555. 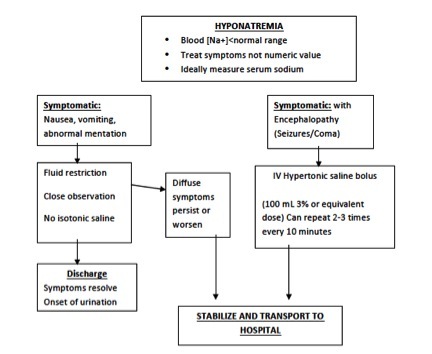 Rosner MH, Kirven J. Exercise-associated hyponatremia. Clin J Am Soc Nephrol. 2007;2(1):151-161. Toy BJ. The incidence of hyponatremia in prolonged exercise activity. J Athl Train. 1992;27(2):116-118.